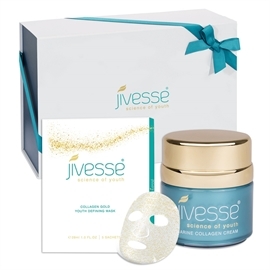 This limited edition Jivesse Gift Set features one pot of our luxurious Jivesse Marine Collagen Cream alongside one box of Jivesse Gold Collagen Face Masks, beautifully presented in a luxury turquoise gift box to add a touch of extravagance to the perfect gift. This limited edition gift set will make an ideal gift or treat for yourself but remember, with only 50 available, when they're gone they're gone, so don’t miss out. Buy now and make yourself or a loved one very happy with a beautifully presented gift of pure, unadulterated skin indulgence. This amazing gift set is great value for money. In total, these three products are worth £295 and for a limited time only you can get these products, beautifully presented, for just £189! Individual selling price for the cream is £85, capsules £85 and the masks £125!